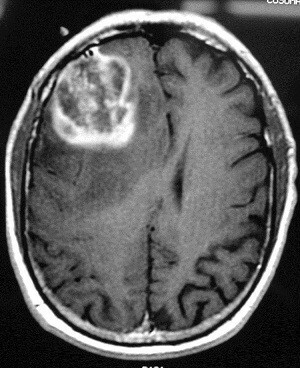 Brain Cancer is the state at which Cancer Cells spread rapidly through the brain most commonly creating a tumor. This can cause many problems, one major one is that tumors can cause problems with your central nervous system. Brain Cancer starts from tumors in the Brain also known as Glioma. Not all Glioma tumors are cancerous though, some are and some aren't. Glioma tumors are not the only type of Brain Cancer, but it is the most common type of Brain Cancer. Why should you care about Brain Cancer? Well each year there are about 78,000 people are diagnosed with Brain Cancer. Of those people 15,320 adults from Brain Cancer. Brain Cancer is most often caused by Cancer Cells arising in Brain tissue, but not all Brain Cancers are caused but that. For example Metastatic brain cancer caused by the spread of cancer cells from an organ to the brain. Brain Cancer Symptoms depend on many things including the tumor type, size, location health, age, and tumor grade plus much more. The most common Brain Cancer symptoms are headaches that are worse in the mourning, muscle twitches, loss of control of body functions, nausea or vomiting, and major personality or memory changes. There are four grades of Brain/Cancer. Grade 1: Cancer cells are minimal and will most likely look like normal cells and will be growing slowly. Grade 2: Cancer cells look a little different compared to normal cells and are growing a little faster. Grade 3: Cancer cells are growing much faster and will have an abnormal appearance. Grade 4: The Cancer cells are spreading rapidly and have a very distinct appearance. Treatment plans for Brain Cancer patients will vary on many things including tumor type, size, location, health, age, the patient's wishes, tumor grade plus much more. The best treatment for Brain Cancer is removal of the tumor through surgery. If the tumor can't be removed through surgery because it may cause further Brain damage, then radiation therapy, would be most likely used to destroy tumor tissue that cannot be removed with surgery or to kill cancer cells that may remain after surgery, or when surgery is not possible. How Can Your Diet Affect Brain Cancer? Studies show that diet affect Brain Cancer very little. Although your diet does not play the biggest roll in Brain cancer, it is still good to eat lots of fruits and vegetables if you are going through Chemotherapy to replenish the nutrients it is taking out of your body. 78,000 new cases of primary brain tumors are expected to be diagnosed this year. This figure includes nearly 25,000 primary malignant and 53,000 non-malignant brain tumors. ost common cancer among those age 0-19 .